I was recently afforded the opportunity to appear on Scott Nicolay’s podcast, The Outer Dark (Project iRadio). L’esprit de l’escalier has been particularly pronounced in the wake of the interview and subsequent social-media (ephemeral as it may be) conversations. Still, we managed to discuss the eerier writings of Henry James and Hawthorne, as well as the relationship with my writing and the structure (houses included) of societal rituals. For over a decade, Thanksgiving Day (owning to the typical, day-off-work traditions) has been, for me, a day to absorb more of what I’m reading (sneak in an extra story or two), and reflect on the writing exercise I’ve accumulated during autumn. (Standing out in my mind with Kodachrome clarity is Thanksgiving, 2000, when I completed Dan Simmons’s Summer of Night. Ignorant of the craft (as I still, in great part, am), that novel was a revelation to me, and I had that quiet period during the holiday, and extended winter holiday, to wonder what it would be like to write something — anything. Scott Nicolay has been enormously supportive of the Ghouljaw endeavor. So, on this Thanksgiving Day, 2015, I’d like to record my gratitude for his writerly camaraderie, and for his high-octane celebration of little-known scribblers dog-paddling in weird waters. Corey Michael Dalton — the creative connoisseur behind the project — just dropped news, revealing the cover art for the soon-to-be released Mythic Indy anthology. (Hopes are high that this becomes an ongoing series, maybe even an annual publication.) Artwork credit goes to deft talents of Amy McAdams Gonzalez. 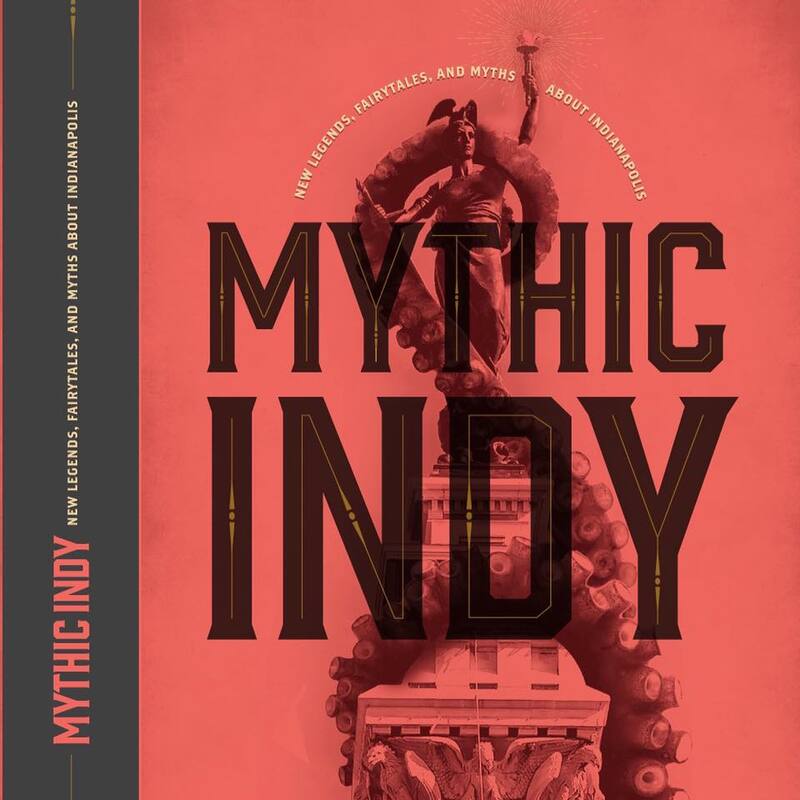 “Mythic Indy is an anthology of weird stories set in Indianapolis that will benefit the programs of Second Story to introduce Indianapolis-area kids to creative writing. We have the stories. We have the kids. Now we need your help. Ben H. Winters, the author of several New York Times best-selling novels including Sense and Sensibility and Sea Monsters and The Last Policeman trilogy. Maurice Broaddus, who wrote an original story set in the world of his Knights of Breton Court novels specifically for the anthology. Sarah Layden, whose debut novel Trip Through Your Wires is currently receiving rave reviews from outlets like The Chicago Tribune. Clint Smith, author of Ghouljaw and Other Stories, whose short story “Dirt on Vicky” is slated for inclusion in the Best New Horror No. 26 anthology. Eliza Tudor, whose work has appeared or is forthcoming in Hobart, PANK, Annalemma, specs, Weave, and Paper Darts. Laura VanArendonk Baugh, best-selling and award-winning author of numerous stories and books including Kitsune-Tsuki, Smoke and Fears, and So to Honor Him. Annie Sullivan, a graduate of Butler’s MFA program whose novel manuscript, Goldilocks, won the Luminis Books Award at the Midwest Writers Workshop. Alex Mattingly, whose work has been published in numerous journals including PANK, Annalemma, Midwestern Gothic, and Flywheel.